The process starts with railcars full of paraffin wax. 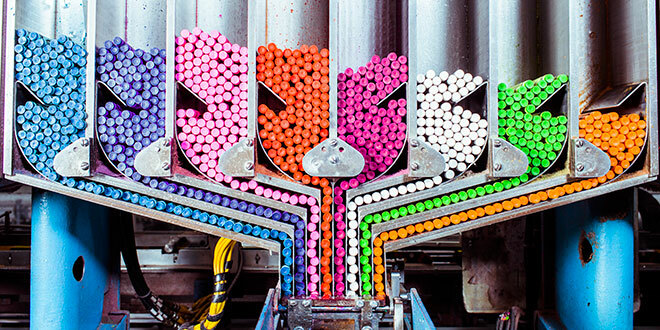 Crayola processes their crayons like they would food, which is good, because crayons are a likely part of most children’s diet. Twice a week the railcars of wax are heated with steam by an oil-filled boiler, while workers pump the molten wax into a silo. Each silo holds up to 100,000 pounds of wax, and the factory uses a silo a day. The silos have pipes attached where the wax travels to the mixing area where workers adding strengthening agents and the powdered pigment. The liquid wax then moves into the cooling station — a steel rotary mold with a flat top — and an ejection station and robotic arm attached which carries them over to the labeling station. Although there are 120 different shades of Crayola, there are only 18 labels made, which cover the whole color spectrum. The sticks are fed into a funnel and put on a platform where a mechanical arm sweeps them into a box where a laser etches a date code on the box, and a metal detector makes sure there is nothing but crayon inside. After that, they are boxed up and put on pallets to ship out worldwide. If you would like to know more details about the process, click here.